As a teacher, I am shocked at the number of students that can not read an analog clock. Is it that our current society is so dependent upon digital clocks or is the math program not reinforcing it enough. Knowing that this problem still persists within the grades that I teach, I knew that I had to find an application that might help my students and yes, even my own pre-kindergartener. According to our school benchmarks, grades K -3 have specific standards which are to be met as it relates to time. As a pre-first grader, they are expected to: tell time to the nearest half-hour and hour. As a first grader, they are expected to: tell time to the nearest 15 minutes. As a second grader, they are expected to: tell, show, and write time to the nearest 5 minutes. As a third grader, they are expected to: tell, show, and write time to the nearest minute; determine elapsed time. So Applicable2U wanted to see if It’s Learning Time might fit our needs. While exploring and playing, my son overheard the positive verbal reinforcement and clock ticking and was immediately interested in seeing what I was doing. This educational app has four levels of difficulty. Level 1 – asks the user to set the spoken clock time. Level 2 – asks the user to set the spoken clock time up to the half hour. Level 3 – asks the user to set the spoken clock to the hour, half hour, and quarter hour. Level 4 – asks the user to set the clock to the exact minute that is spoken. Within the application options, a parent or user can disable various things. For example, time can be set to UK standards, the ticking sound of the clock can be set to on or off, and there is the option to turn on the digital clock. In addition, there is a practice mode that allows a user to set and hear the clock to any particular time. If you compare those benchmarks that are to be met from pre-first to third grade, does It’s Learning Time fit our needs, most definitely!!! For my son, this application was a challenge, but will certainly come in handy in the months to come. What would I love to see in future updates: 1) An added screen that briefly describes some of the important vocabulary words: clockwise, counter clockwise, minute/hour hand to name a few. This could be done with an interactive model which might appeal to early learners just exploring time. 2) Adding in a Test mode would be a definite bonus. The test mode would allow the user to show what they have learned from all four levels. For example, as they enter the test mode, have the students choose to see the time in words or digitally. Once chosen, a clock would begin to tick. A user would need to stop the clock when the hands are in the matching position. Applicable2U thinks that It’s Learning Time can assist your child and/or students with a mathematical struggle. Implement individually on iTouches during center time. Or incorporate as a whole group with the use of an iPad that can be connected to a projector so students can see it on a large screen. Either way, time will no longer be an issue. To learn more about EduGame, check out EduGame’s website for additional information. 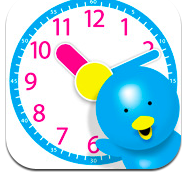 If telling time a problem in your house/classroom too, then begin your download today from your iTunes Library of It’s Learning Time.